I was lucky enough to secure a slot in Pinay Doulas Collective’s Kwentuhang Kababaihan: Our Birth Stories last March 30, 2016. 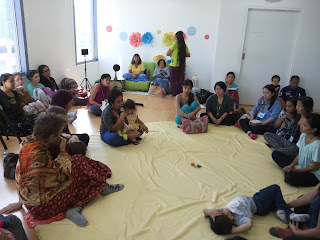 When I asked for pocket money and registration fee from my husband for this event, I have convinced him that I needed it for the betterment of my breastfeeding peer counseling and that we could really use it for the next child (if and only if). He laughed and shook his head on the thought of the next child. 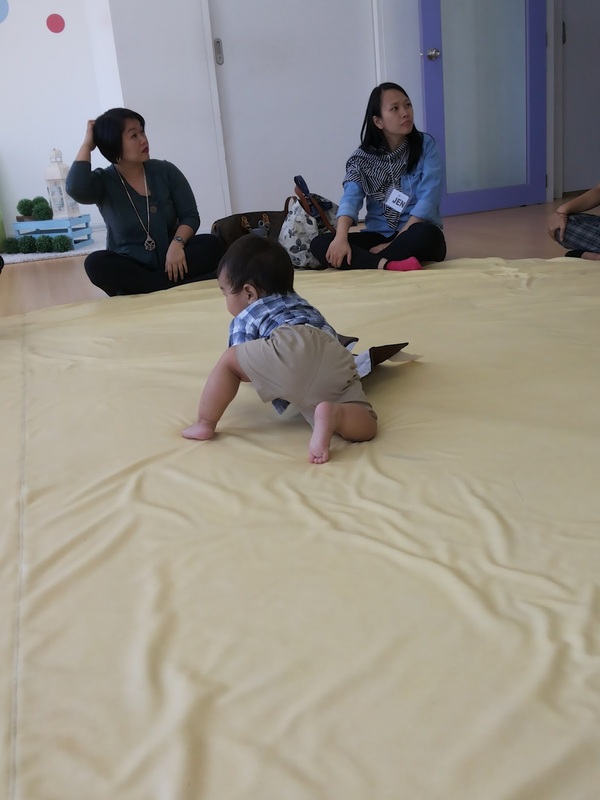 There was a large circular padded mat in the middle of a room at Kindermusik in Bonifacio Global City. I placed Khale in front of me, and he giddily crawled across. He reached, surprisingly, a woman I know. My uncle’s wife was there, too. It was the first time I saw her in person and Khale found her. I crawled after Khale and introduced myself. Then I saw a woman walking on the side of the room where I sat earlier; hugging and kissing everyone on the cheek. When we came back to our spot, she was somewhere else already; hence, no hugs and kisses for me and my little bub. I wanted to run after her and ask for it, really, but then the stories started. The woman is Robin Lim or Ibu (Mother) Robin. She is a midwife, founder of Yayasan Bumi Sehat Birth Centers, and awardee of the 2011 CNN Hero of the Year. I have searched about her before coming to the event and found her awarding video. It made me cry. She exuded the aura of every bit of a loving mother. She was like a ray of sunshine; warm and bright, even in the afternoon. 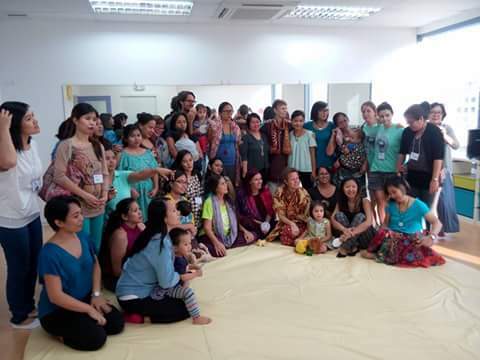 The room was filled with Ibu, midwives from Bumi Sehat and Shiphrah Birthing Home, mothers, fathers, and children. We started with introductions. Deb from Shiphrah and Khale's new friend. He bit on her name tag. 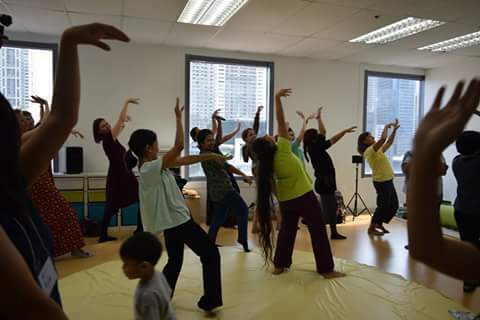 We had a dance led by Pinay Doulas’ resident dancer, Noelle Pollack. I danced with Khale while carrying him. It was such a workout for someone who wasn't a dancer. I was like a tree. A bamboo was even more graceful than me. Then we sat down again, and began the birth stories. There was a woman who got rejected several times by obstetricians because they thought that the birth that she wanted was “too ambitious”. There was a mother of four who had wonderful birth stories to tell. There was a mother with a daughter who was having her second pregnancy. She lost her first grandchild. There was a doula who gave birth via cesarean section twice. There was another doula that was told that she only needed to “kick the door”. There was a daughter whose midwife mother did not want to interfere with her childbirth; and there was the midwife mother who said that during the moment her daughter was giving birth, she was not a midwife, but she was a grandmother. There was a father of two who recalled his wife’s smile while fully dilated on the birth of their second. I was particularly teary-eyed on the father’s story, but there were a lot of tears that afternoon. “I had a very normal and easy pregnancy, except for the first trimester when I had my all-day sickness to the point of vomiting blood. My husband and I created a birth plan on the third trimester, and discussed it with our OB. I said I wanted my husband in the delivery room, so I can hold his hand while pushing; and the doctor said it was not allowed in the hospital, but that she would call him when the baby starts to crown. I said I wanted to walk during labor. She said, I couldn’t because I would be strapped to a fetal monitor. I said I wanted to have delayed cord clamping. She said yes. I asked if my husband could cut the cord. She said yes. I said I wanted unang yakap (first embrace) and immediate rooming in. She said it was protocol. Several people in the room nodded and agreed. It is true, yes? Being non-medical people who only rely on Google and who only see a whole bunch of hospital births shown by the media, we think these are all normal. 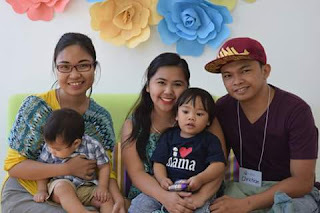 “On my 40th week, I found myself walking under the rain on our roof deck with an umbrella, requesting my son to come out because my parents have dragged me to the mall for two weeks to help with labor, to no avail. Three more days after, I said yes to my doctor when she asked if I wanted to be admitted because I was overdue already and 1 cm dilated. My doctor was nice, but I didn’t know so much and I was not told the option that I could wait till the 42nd week. All I knew was that I was excited to see my son. I thought I was going to give birth that night, but I didn’t. When I was in the admitting area, there was a woman who was crying and shouting on the bed beside mine. Being the jolly me, I talked to her and told her that she could do it. When I got into the labor room, I found myself alone, trapped on the bed and at the mercy of nurses when I needed to pee Worse, my husband was only allowed to see and talk to me by the door once; and he tried to keep coming back hoping that the nurse on-duty will change and let him see me again. I labored from 5 P.M. until 3 A.M. I progressed and my cervix became 3 cm dilated. There was a point during the labor where the fetal heart rate rose and everyone panicked and asked me if he was moving. He was. I was allowed 7 hours of rest in my own room. Then they rolled me back to the labor room again the next day at 10 A.M. By 12 N.N., the fetal heart rate rose. The baby was no longer moving. My doctor said she would have to perform a cesarean section. I cried because I have mustered up all the courage to push in a normal delivery. I have even refused anesthesia, and there we were. My son was in danger. The process took 15 minutes. I was awake the whole time. Khale came out in cord coil. We had unang singhot (first sniff) and not unang yakap. My husband did not know if the delayed cord clamping was done. He did not cut the cord. As far as I know, only the immediate rooming-in was performed. And after all that, I was just thankful that I was able to successfully breastfeed Khale from day 1. Ibu Robin emphasized on the importance of gentle births; how cesarean section may sometimes be necessary, but it can be gentle as well; how we needed and deserved the respect from people who were supposedly there to help us with childbirth; and how things like the stories we have shared can affect our relationships. Postpartum depression is very real. A traumatic birth experience may affect the mothering of the mother to her child. I have a friend who refused to take care of her child when she gave birth, because all she could remember was the pain brought to her by her birthing experience. She shared with us the video of her own daughter-in-law’s water birth, and my, my. If I could turn back time, I would go for a delivery like that. Please do remember that a mother is a mother no matter how we give birth. We will never be any less than one. A gentle birth is not about childbirth in water or through a normal delivery or without anesthesia. It is about respect, about giving you options, and informing you of those options. And I wish I knew about these things before. This is beautiful! I hoped every mother will have a choice or options on giving birth! Me, I don't have a choice because I've given birth to twins, so there is a lot of risk. Sabi nga ni Ibu, pwede naman gentle however we want to give birth. :) at least to hold our partner's hand siguro while giving birth. You're one amazing mumma, still! 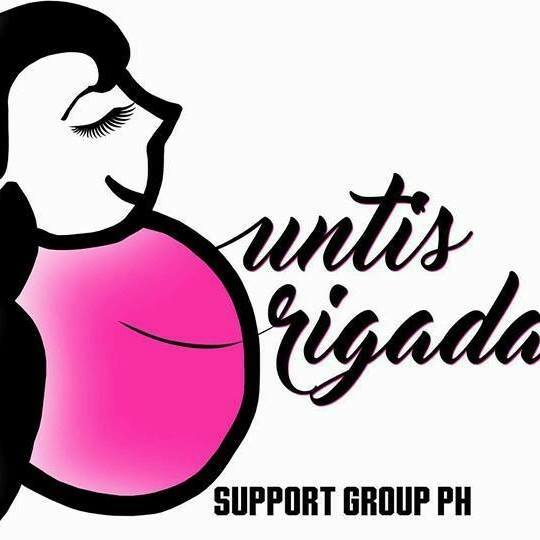 Thanks for sharing your experience, and for reminding everyone that a mother is a mother no matter how she gave birth, or even how she carried her child (or even if she didn't carry her child). But at the risk of sounding contravida, I believe the doctors (at least in general) still have the patient's best interests in mind. They probably have good reasons for imposing such and such rules, and for recommending certain procedures. I'm lucky that during the my first time I gave birth everything went perfectly. My husband was beside me, too, because the Asian Hospital allows it (huge reason why I gave birth there). Thus I'm curious--what could the hospital have done more? I mean, if it happens to me, what can I do kaya? What a lovely event! I gave birth via emergency CS - thank you for pointing out that all of us are mums regardless of our birth procedure. And yes, postpartum depression is real. I went through it and I'm just grateful that phase of my life is finished! 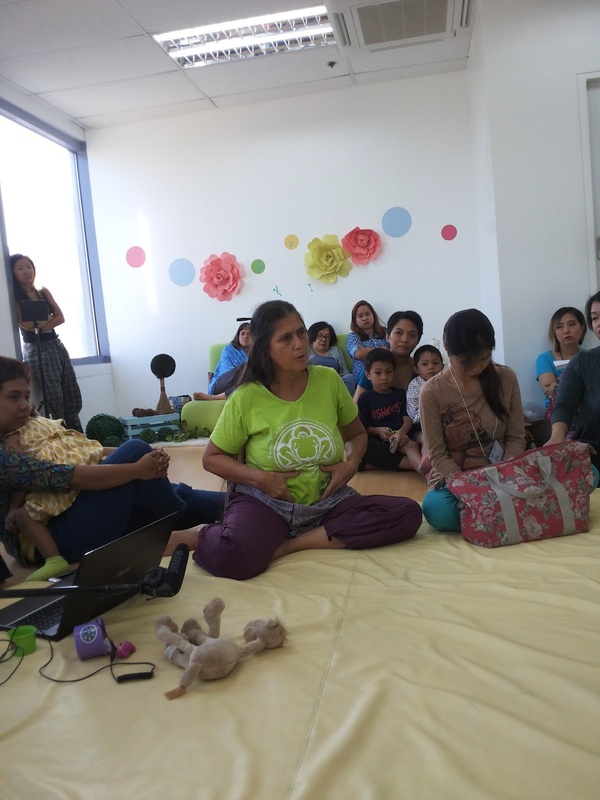 Thank you for sharing your birthing story. 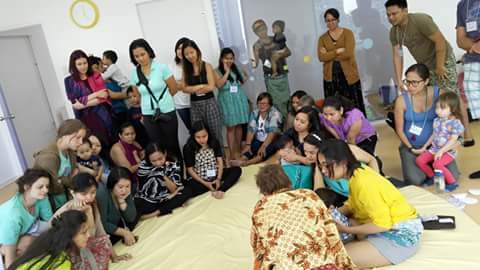 How I wish I'll be able to attend something like this in the future, to be surrounded by moms and other people who I have so much respect. I've been hearing a lot about doula and water birth. I am seeing photos in facebook too and it looks great but I'm too afraid to do it (if I got a chance to have another baby). I love your birthing story though I know you wanted more than that. I gave birth via Normal Delivery and I thank God for that but like you said regardless of how we give birth, this will not make us less as a mother. I wish I knew about this before. I read a lot of articles when I was about to give birth. It just made me panic because I was super scared. I'm super lucky that mine was a normal one, albeit being a long one. The saving factor was that I was with my husband the whole time. I never went down to a birthing plan, so I was very lucky that we've chosen a good hospital. This time, I know better, in case we have another child too. Haha! 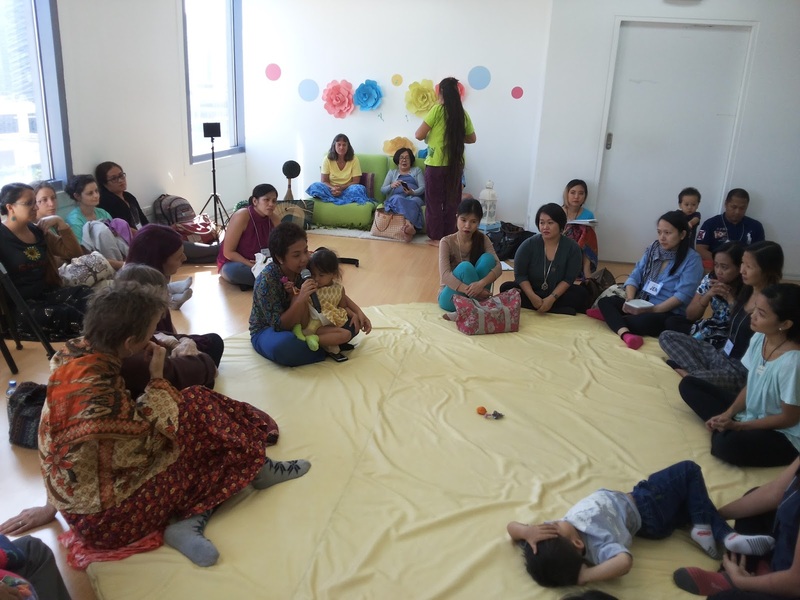 I have just recently learned about doulas and it is good to know that pregnant women can rely on them to make their birthing stories just the way they want them to be. I am not sure I will get one on my next pregnancy, but I guess having one on your side would lessen the stress and the worries of giving birth.